Explore the following fun creations for the little people you love. They are available on-demand in limited quantities. Contact me at barbara@heavenswait.com for more info. The Drippils’ first Storybook! 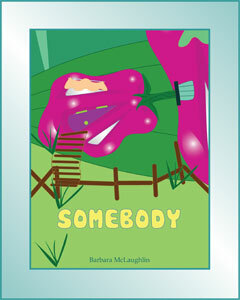 See what Floplee learns from the other Drippils in this original story from the world of Heaven’s Wait. If you take some time to learn a little about the Drippils before you read this story, either from the Character Bookmarks or from the Meet the Drippils section of this site, you will know who they are when you see them in the pictures. 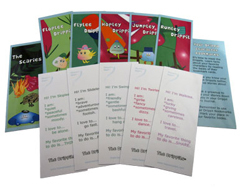 You will also receive a Drippils CD, “Introducing the Drippils,” with your storybook, where you’ll find an interactive version of the story, as well as other Drippils activities. 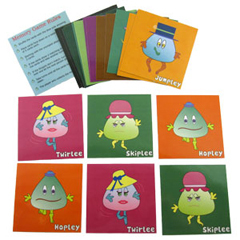 A delightful set of laminated cards that includes all of the fun, colorful Drippils. Test your concentration and memory skills by finding the matching Drippil cards. Excellent for playing alone or with a friend. These limited-edition, hand-cut and produced cards are easy to take with you wherever you go. Play lots of games with your new deck of Drippils cards. Learn games like Who’s to Blame, Slurp!, One to Ten, and Home! But beware of the Scaries. They get shuffled in with the rest of the Drippils, adding surprises and fun as you play.This is a imited-edition, hand-produced item. 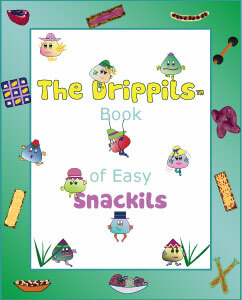 Make yummy snacks for your family and friends with the Drippils’ first cookbook. You might like to try “Nut Goo Trees” or “Drippizzas.” All the recipes have silly names, easy directions and ingredients that most kids love. The colorful hand-produced booklet also makes a great gift for friends who love Drippils. Have fun exploring the Drippilville neighborhood while your handy Snackmat holds the afternoon snack you made from your Drippils Book of Easy Snackils. 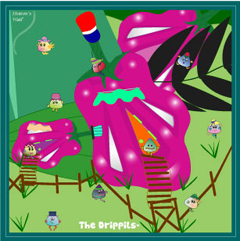 See how the Drippils live in their hidden neighborhood, which is tucked neatly under a giant vovo plant in the land of Heaven’s Wait. Remember to wipe your Snackmat clean, so you can use it again and again. A colorful collection of 10 laminated, hand-produced bookmarks that feature each of the silly little Drippils and their very own fun facts. A bonus bookmark is also included that introduces The Scaries, who bring danger to the Drippils and their town. 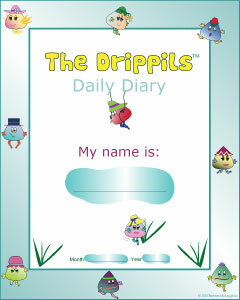 Learn the various facts about each of the Drippils, then write your own Drippils stories, based on what you’ve learned. A fun diary booklet that gives you a place to write a few words about yourself and your everyday thoughts. Diary writing is a great way for you to start building a growing story about yourself, as a lasting keepsake. Would you like to print out your own Daily Diaries when this one is filled? Home-printable Daily Diary pages may be found on the Drippils CD, “Introducing the Drippils”, which is included with the Drippils Storybook-Somebody. 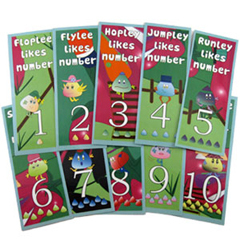 A colorful collection of 10 laminated, magnetic Drippils bookmarks that help you learn your numbers. Hang the bookmarks on magnetic surfaces, like your refrigerator or dishwasher. Mix them up. Move them around. Count and organize. 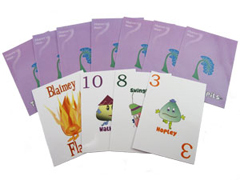 Make up your own games with the Number Bookmarks. This is a imited-edition, hand-produced item. Next time you go to a friend’s birthday party, give him or her a special card from you and one of your new Drippil friends. 10 original, hand-produced greeting cards, each one featuring a different Drippil, are included, as well as blank envelopes. 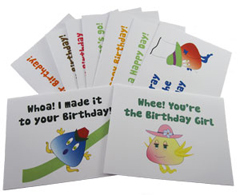 Introduce your friends to the world of Drippils with these delightful, colorful Drippil greeting cards!